Way Down in Chinatown (2014) - Sci-fi-central.com. USA  2014  83m   Directed by: Eric Michael Kochmer.  Starring: Stephanie Sanditz, Justin Dray, Maria Olsen, Eric Michael Kochmer, Lisa Loring, Nancy Wolfe, Ashli Haynes, Tara Samuel, Whit Spurgeon, Alana DiMaria, Angel Corbin, Tim Ahrens, Michael A Barrett.  Music by: James Anthony Cotton. The atmosphere is quickly depleting but nevertheless playwright Victor Mitchum and director Jessica Mitchum continue to audition and mount their play. While they are coping with these pre-production conditions two strange theater producers stalk them and possibly have an answer to a tour in the next world. Way Down in Chinatown is a sci-fi noir thriller that will challenge your senses. This low budget art film has a few very hilarious moments, some surprisingly great acting, and is just weird enough to maintain viewer interest in where things are going. However, the film suffers from leaden pacing, obtuse plot, and grating sound design. A 30-something playwright and his wife attempt to cast and put together a musical focused on the end of the world, but matters become complicated once they bring in some demonic producers (played by the actual director and producer of the film), start cheating on each other, and lose their sense of reality. Perhaps the real apocalypse starts too loom as well? It's difficult to tell - this isn't the kind of film that delineates between the story's reality and the characters' hallucinations. In many respects it owes a lot to David Lynch and David Cronenberg, recycling a lot of "plot" (if you can call it that) elements from MULHOLLAND DRIVE including a focus on a small box, a subplot involving entertainers putting together a production, and a befuddled protagonist succumbing to a lesbian seduction. Also things seem vaguely centered around the concept of parasitic worms which spread corruption through oral contact, echoing SHIVERS, though nothing is really spelled out. What keeps things somewhat original though is a focus around the oncoming end times, but this element is largely undone by how it's portrayed, reminding me of the old Star Trek episode "The Alternative Factor" in which the universe winks out periodically and everyone gets disoriented. 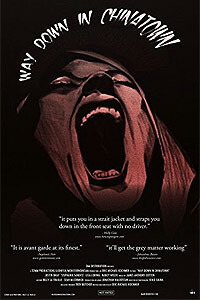 In this film, the apocalypse is realized (annoyingly) by frequent clouding of the picture accompanied by a sound negatively comparable to nails on the chalkboard, causing characters to fall ill or simply drop dead. If being exposed to audiovisual nuisances and confusion is your sort of thing, look no further, because there is a lot of that this film. Even if the film doesn't feel completely original, it's largely saved by terrific and convincing work from most of the cast who look like they're having a ball. Strangely enough, despite WAY DOWN IN CHINATOWN's shortcomings, it actually manages to be more accessible, interesting, and successfully surreal than most of its inspiration David Lynch's recent and more expensive work. Review by Michael A. Martinez from the Internet Movie Database.